Aerin will launch Éclat de Vert, a new fresh floral fragrance for women. Éclat de Vert was inspired by Aerin Lauder's early memories of summers in the south of France. The notes include citrus, galbanum, jasmine, magnolia, orris and ambrox. 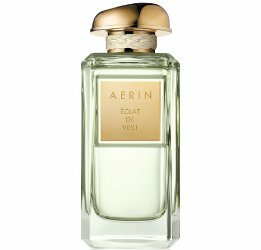 Aerin Éclat de Vert will be available in 50 and 100 ml Eau de Parfum. Inspired by the vibrant coast in the South of France, Éclat de Vert is reminiscent of light streaming through lush, glossy leaves. Sparkling notes of Citrus, Magnolia and Jasmine are crafted with an exclusive green dimension comprised of Galbanum and Lentisque Absolute, precious ingredients that deliver an intriguing, woody depth.